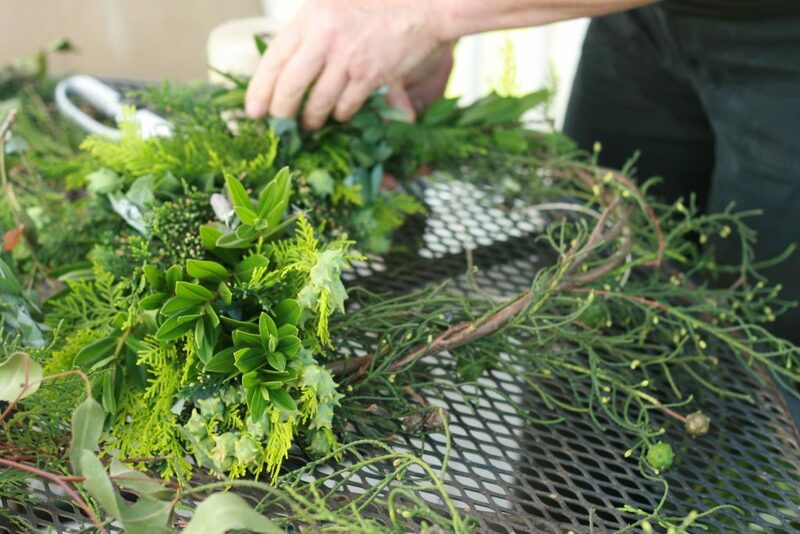 Ahead of the silly season, we asked our friends at Under The Moon Elopements and This Simple Gesture to create the ultimate guide to making your own foraged Christmas Wreath. There are a few important things to know when foraging to make the most perfect Christmas wreath. Follow the below steps by Bec from This Simple Gesture, and find out how easy it is to DIY your statement front-door-piece this year! Step One: Explore and forage! Firstly, you need greenery – a lot of it. 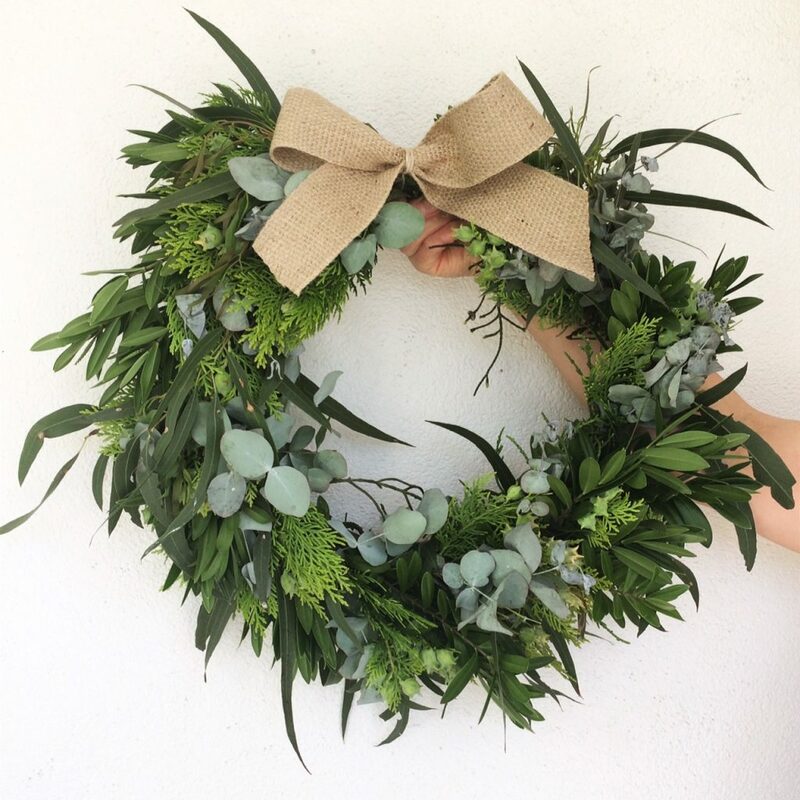 Conifers and eucalyptus trees provide plenty of variety and are long lasting in a wreath. You will need at least three to four different types of plants. This will give your wreath volume and contrast. Secondly, you’ll need a set of tools – a good pair of secateurs, gloves and a sturdy pair of shoes. Thirdly, you need a bucket to put your collected greenery in. You will need at least a full bucket load of the three/four different plant cuttings to make a 30cm wreath. We recommend that you half fill your bucket/s with lukewarm water and add a floral preservative. It is usually a good idea to let your plant cuttings stand overnight before working them into a wreath. Oh, and if you can get someone to help you carry the heavy bucket of greenery that’s even better! For our Christmas wreath we used Spruce, Juniper, Hebe and Eucalyptus. We love using these plants because we have plenty of them in our garden (but feel free to use anything you can get your hands on!). These types of plants last for a couple of weeks and the aromas of spruce and eucalyptus is absolutely divine – it smells just like Christmas. They also have an interesting arrangement of seed pods – we love this! 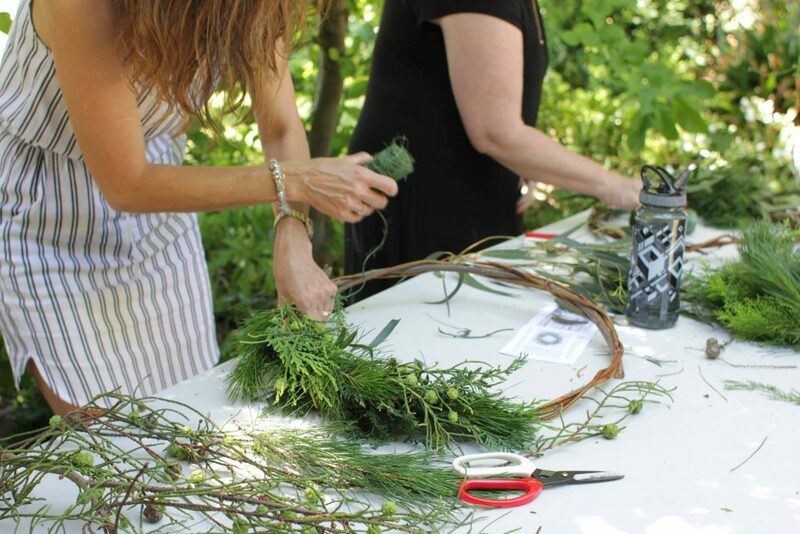 Cut each branch into small sprigs and put each type of plant into a pile, ready to start making the wreath. We use a type of juniper as the frame of the wreath – it’s really pliable and biodegradable which means that there is no waste when the wreath is ready to be taken down and taken apart (just place it straight in the compost). Olive tree branches, Mulberry and Ivy are also great for this. We tend not to use flowers in our Christmas wreaths, as we like it to last for a couple of weeks. If you did want to use flowers, natives would be the best way to go as they will last longer. Alternatively add a burlap bow or a wide Christmas ribbon for extra trim. 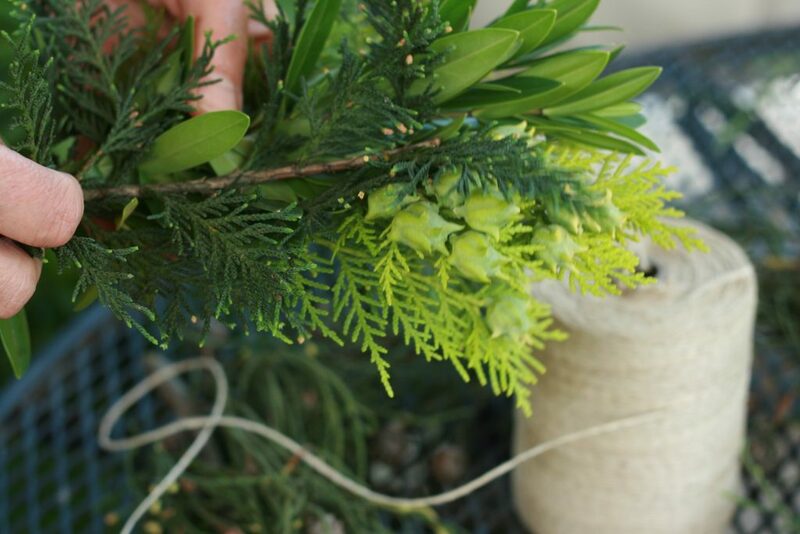 Once you have collected your greenery you can start making your wreath by simply tying on the cuttings with hemp twine! Make sure the container you will be storing your plants in is clean before mixing ingredients. 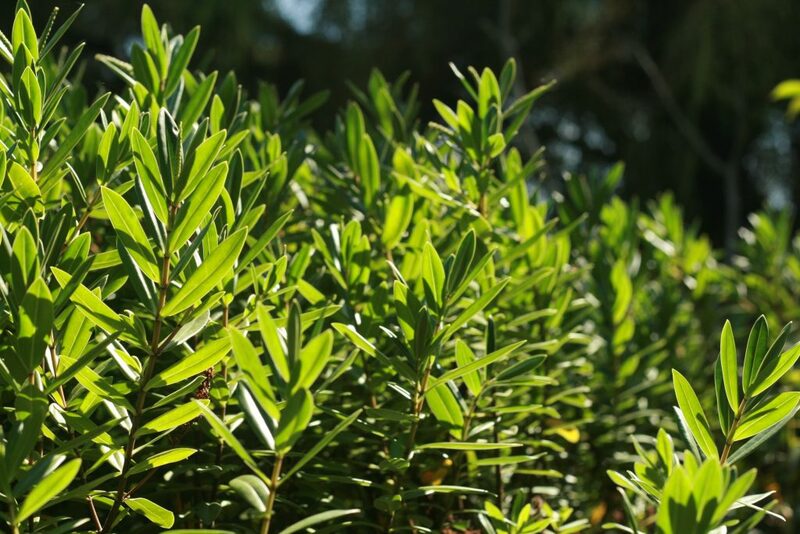 Trim any leaves and branches that will be below the water surface before submerging plants. Discard any submerged leaves or flowers because the freshness of plants is influenced by the gases and bacteria found on wilted or rotting plant material. If you can, keep your plants in a cool location and out of the sun. Text by Under the Moon Vendor Bec Snell.